It was a chain reaction. I picked up a copy of Tamasin Day-Lewis’ book Supper for a Song at the library, and while finding it attractive but irritating (does she really think that scallops and pheasant are budget ingredients?) 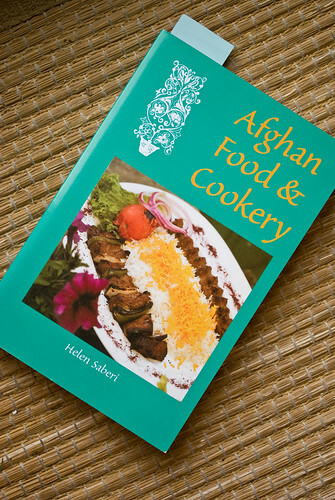 also noticed that she included a lot of Afghan-inspired recipes from the book Noshe Djan by Helen Saberi. I adore Central Asian food, especially Afghan, but have very few recipes to work from, so I was happy to get the recommendation. I returned Day-Lewis to the library and went looking for Saberi instead. I managed to find the book shortly afterwards while browsing at Barbara-Jo’s Books to Cooks in Vancouver (always a good place to look for obscure cookbooks), republished under the title Afghan Food & Cookery. It’s definitely no-frills, but there are some really intriguing dishes in here, including several versions of ash and a hell of a lot of kebabs. I finally tried some recipes out of it last week, and was pleased with the amount of detail in the cooking instructions. The spinach with rhubarb was very successful, the mastawa (sticky rice with lamb and yogurt) more of a mixed result. I want to make both of them again, but possibly with some adjustments. 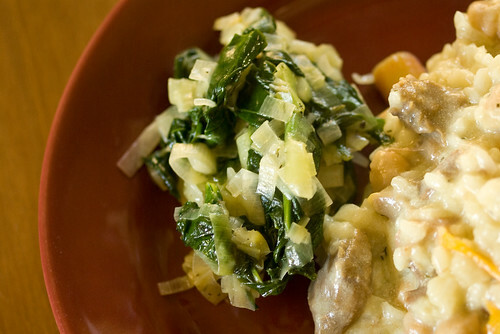 The spinach dish is a wonderful thing to make at this season, when greens and rhubarb are both at their best. 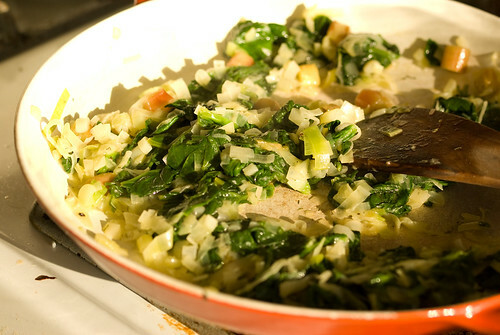 I sliced some leeks, sauteed them in olive oil, then added spinach to the pan and cooked it down. A stalk of rhubarb, cut into pieces, was fried in a little oil and tossed in along with some dried dill. The whole thing cooks down to a rather unappetizing-looking mess, but it’s delicious, the rhubarb adding a quiet tart note that balances the sweetness of the leeks. It reminded me of the Kurdish Rhubarb Braise that we often make in early summer, but it’s much simpler. Mastawa was much more complicated and time-consuming. I simmered whole lamb shoulder chops with water and onions until the meat fell off the bones, then shredded it by hand. 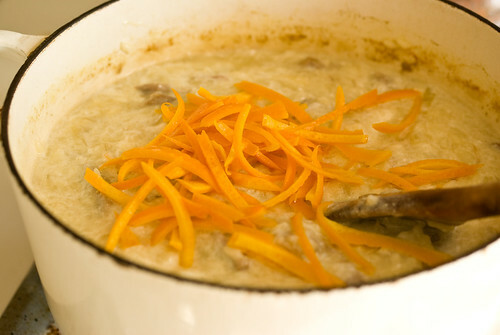 I added washed short-grain rice to the lamb and broth and let it cook, then added soaked orange peel, a can of chickpeas, two whole cups of yogurt and dried dill. 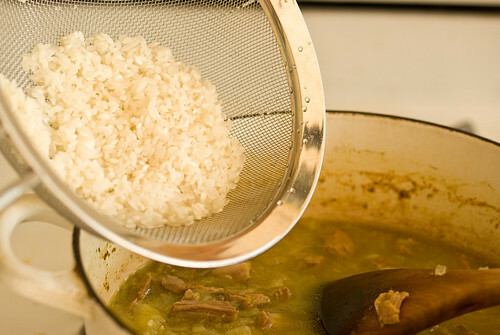 It smelled wonderful, but the result was strangely like orange rice pudding – the lamb and onions nearly vanished, and the orange flavor was overwhelming against the blandness of the rice and yogurt. It was very soothing, like congee, and we found a good splash of Sriracha helped a lot to perk it up. 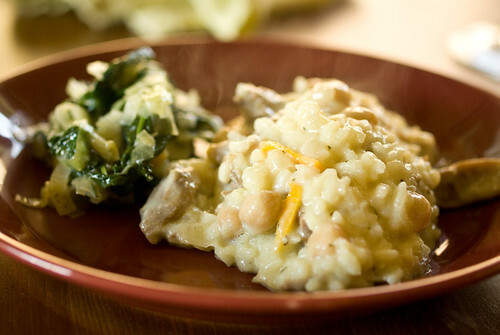 I would make this again if I wanted something soft and comforting to eat from a deep bowl in an armchair during the winter, otherwise I would maybe add less rice and a lot more herbs. I do think it was a successful venture into Afghan cookery. Looking forward to grilling some kebabs and naan! I would also change the form of the orange peel. 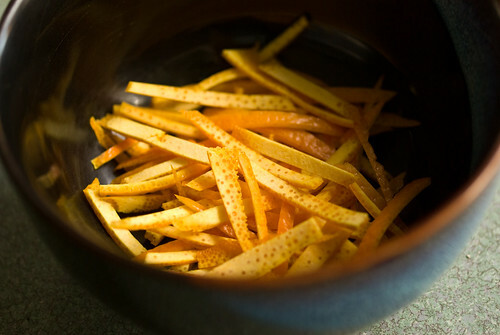 The recipe said to cut the peel (trimmed of pith) into matchstick-sized pieces. Maybe it was the variety of orange we used, but I found the resulting pieces of orange peel to be unpleasantly large. Next time, I’d use a Microplane to get much smaller pieces. This looks and sounds delicious! I’ve been wanting to try Afghan food, and wonder if it’s at all like Persian cuisine, for which I’m totally mad. You’ve inspired me to check out a cook book, for sure! Afghan and Persian cuisine do have a lot in common, definitely. 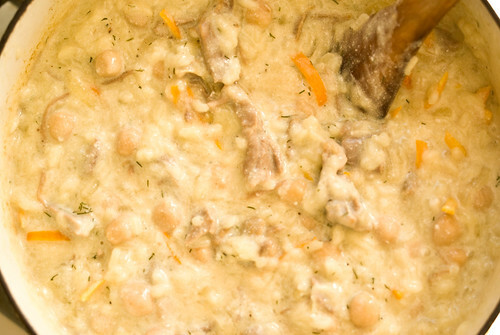 I love the use of lamb, yogurt, legumes, and tons of aromatic herbs. The Afghan restaurant we like to go to in Seattle makes the best eggplant dish I’ve ever had, plus a wonderful flatbread called lavash – very very thin and dry, for scooping up sauce. Haven’t tried making that yet, although I did make Snowshoe Naan a few days ago, out of Flatbreads & Flavors. Yum. I made the Afghan snowshoe Naan from “Flatbreads and Flavors” today! I am a not sure whether my dough is too hard and dry on the crust. The interior is nice and chewy, though. How did yours turn out? It was good right out of the oven, rather like a sturdy pizza dough – very chewy with lots of wheat flavor. I found that it wasn’t as fluffy as I had hoped, though, and it didn’t hold up well. I baked it on a pizza stone at very high heat, but it didn’t really char or blister – maybe on the grill would work better? I recently tried an Indian naan recipe made with white flour, buttermilk and baking powder, and it worked really well – I’ll post on it eventually. I am becoming more and more fond of Central Asian as well as North African cuisine as I have had a handful of foodie friends travel to those areas and return with the adventure of trying out new recipes with the local types of spices. And I’ve fallen in love with cardamon and lemon flavors found in these dishes. I’ve been toying with the idea of submitting some of these to cooking contests in the future once I get a little more savvy with them.